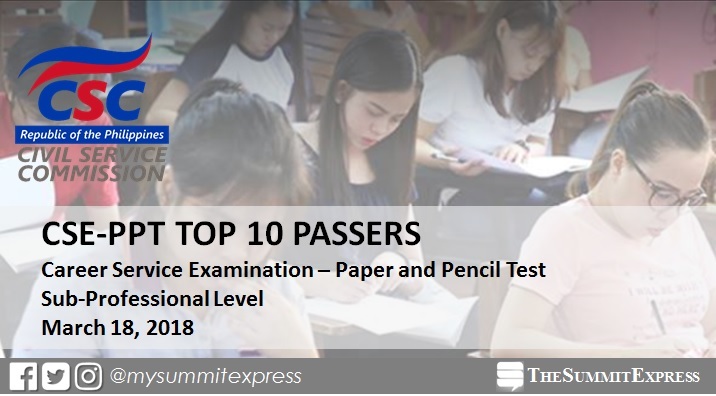 MANILA, Philippines – The Civil Service Commission (CSC) hailed the top 9 passers of March 18, 2018 Civil Service Exam or Career Service Examination-Pen and Paper Test (CSE-PPT) in six (6) days after the release of results. View on this page for sub-professional level list of topnotchers. CSC released CSE-PPT results on Wednesday, May 16 or 59 days after the exam (ahead of the target date). A total of 4,573 representing 11.20% of the 40,821 examinees successfully passed the civil service sub-professional level examinations. In the August 2017 CSE-PPT, Mark Dave Balmilero from Region II (Cagayan Valley) topped the eligibility exam with 87.54%. It was followed by Western Visayas's Jodi Jill Manikan with 87.38%. In March 2017 exam, Faye S. Cruz from Metro Manila, with an 89.12 rating, placed first among the 31,169 hopefuls of the Sub-Professional level. Roi Solomon B. Labay (NCR) ranked second with 88.87%.